Submitted by Rachel, this article belongs to the Poker Bankroll Management series. Rachel wrote the article below on poker buy in rules. If you have an opinion about it feel free to rate it or leave a comment. A buy-in, by definition, is the amount of cash needed by a player in order to join play in a poker game or tournament. Generally, all real money games will have a set minimum buy-in that is needed before any player can join an active table. There are Minimum and maximum buy-ins when one plays limit poker. Limit poker is a game of poker that has a fixed limit to the amount players can bet, and a set number of raises. During a players turn, they may only bet or raise by an amount equal to the minimum for that round. In limit poker games, the usual poker buy in rules are that a minimum buy-in is equal to 10 times the big blind. There is no maximum buy-in. For example, in a $10/$20 limit game, the big blind value is $10, so the minimum buy-in is equivalent to 10×10, or $100. There are also pot-limit and no-limit games available in land-based and online casinos. Both have a minimum and a maximum buy-in.The maximum buy in for pot-limit and no-limit games depends on the stakes of the game, and sometimes the casino. All pot-limit and no-limit games have a minimum buy in restriction of 35 big blinds and maximum buy-in of 100 big blinds. In a real money poker game one of the buy in rules is that you can only add to your stack between hands. There are some poker tournaments that allow rebuys and add-ons, but generally these can only be done after a hand is over and before the next hand starts. You cannot take any chips off the table during play until you leave the game. This rule applies to any player, regardless of how many chips you brought to the table. It is a matter of personal preference when you are deciding what form your bankroll management will take. All of the methods have their advantages and disadvantages; you should have to decide which matches your playing style and poker goals. The first method is known as the conservative bankroll. A conservative bankroll allows for 1000 Limit big bets or 100 No Limit buy ins. A Conservative bankroll is better designed for the long term or full time poker players, who should plan on experiencing short spurts of losing days without it having much effect on the size of their bankroll. The other approach to a bankroll is the Aggressive bankroll, which usually means 250 Limit big bets or 20 No Limit buy ins. Aggressive bankroll players tend to move up (and/or drop out) quickly and see rapid results. An aggressive bankroll means that hand losses will see your bankroll taking a much faster increase or hit, and is therefore much more difficult to manage. If you are not an extremely controlled player, the aggressive bankroll method will be your downfall. The alternative to both of the methods above, also happens to be the favorite of most casual poker players. It is the Standard Bankroll method, and it is 500 limit big bets or 40 No Limit buy ins. A good rule of thumb is that you should drop down when you become about 30% under-bankrolled for the stakes you’re playing. I’d like to disagree here. 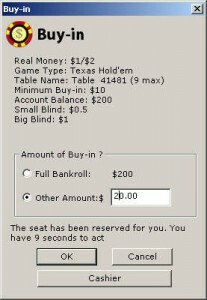 A bankroll management of 20 buy ins for no-Limit games is usually considered as a fairly conservative bankroll management. Standard recommendation for beginners is 25 – 30 buy ins. A real aggressive bankroll management is ~5 buy ins which should be chosen when playing online poker and when you already know how to play poker and aim for moving up through the limits as fast as possible. It of course increases your risk of ruin but on the other hand is often the better alternative compared to the option of being stuck at the micro limit tables and spending months on playing for cents. These are great tips for a beginner poker player looking for advice on buy-in rules!